Contact us today on Christchurch 01202 703080 or Poole 01202 740270. An athletic character - Aerodynamic profile glides from the sculpted bonnet to the sloping boot; it's shaped for timeless style and effortless performance. Well Connected - Using Bluetooth® or USB, you can access information and playlists on your smartphone. You can also transfer your phone’s interface – via Apple CarPlay or Android Auto™ – to the 7” touchscreen to access apps allowing you to make calls, and send and receive messages. Pure Energy - Lighter and more efficient, they’re the next generation engines. 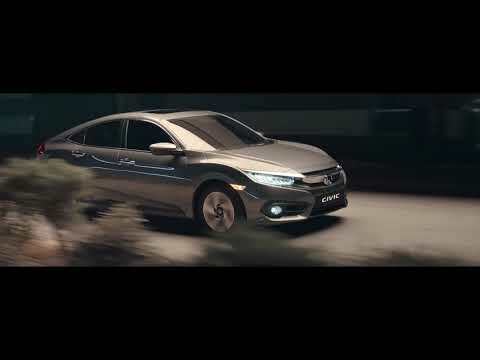 Important Information : Terms & Conditions: Terms and Conditions: New retail Civic ordered from 01 April 2019 to 30 June 2019 and registered by the 30 June 2019. Subject to model and colour availability. Offers applicable at participating dealers (excluding Channel Islands) and are at the promoter’s absolute discretion. Not to be used along with any other offers currently available. *£1,000 Test Drive Incentive: £1,000 customer saving off the On The Road price. £1,000 inc VAT will be applied to the retail invoice. Please visit here to access your voucher code. †Honda Deposit Contribution: £1,250 Honda deposit contribution on new Civic 4 door models purchased through Honda Aspirations. 5.9% APR representative Honda Aspirations (PCP): Maximum customer deposit 30%. You do not have to pay the Final Payment if you return the car at the end of the agreement and you have paid all other amounts due, the vehicle is in good condition and has been serviced in accordance with the Honda service book and the maximum annual mileage has not been exceeded. Excess mileage charge includes VAT at current rate. Indemnities may be required in certain circumstances. Finance is only available to persons aged 18 or over, subject to status. All figures are correct at time of publication but may be subject to change. Honda Franchise Dealers are credit brokers, not lenders. Credit provided by Honda Finance Europe Plc. Cain Road, Bracknell, Berkshire RG12 1HL. Honda Financial Services is a trading name of Honda Finance Europe Plc. Cain Road, Bracknell, Berkshire RG12 1HL a company registered at Companies House No 03289418. Honda Finance Europe plc is authorised and regulated by the Financial Conduct Authority, Financial Services Register number 312541.